Throughout it all, Abby was every inch a timeless bride in her Astrid & Mercedes Felicity gown, which she fell for while visiting Fabulous Frocks in Alexandria, VA.
“I wanted the wedding to feel “traditionally whimsical.” We had a “traditional” Episcopal Church wedding ceremony at Christ Church in Alexandria, Virginia, where I grew up going. A bagpiper played out front and a trumpeter accompanied the organist. Our friends read the psalms and prayers, the priest gave a homily, and my uncle played the guitar and sang. We exchanged vows along with gold bands. My cousins read love letters between my grandparents from 1945. 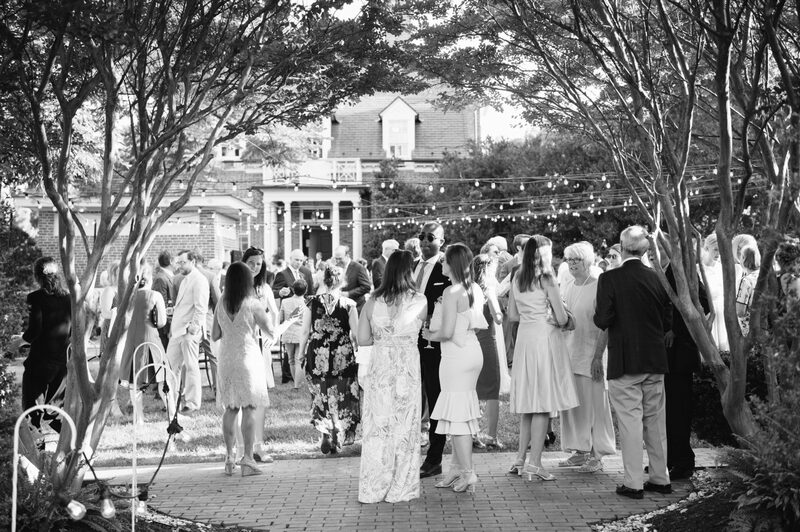 Afterwards, we had an outdoor garden party with a “whimsical” feel at Woodlawn & Pope-Leighey House. Cocktails were in their beautiful garden, followed by dinner, dancing, and dessert in the tent. Our caterer made a beautiful cheese table and passed crab cakes and other bites during the cocktail hour. They then made a beautiful ‘farm to table’ dinner served family style, complete with grilled seasonal vegetables and locally raised beef and fish. Charlie and I lived in southern France and northern California, so we included elements of those experiences by weaving in eucalyptus and lavender to the table settings, my bouquet, and his boutonniere. We displayed family wedding photos of generations before us. My sister and I have a linen pants business called Morning at the Market, so we love fabric and wanted it to be fun. We had colorfully printed napkins tucked with personalized menus. Our table assignments were hand-written on wildflower packets, encouraging guests to find their seats and then take the seeds home and plant them with the quote ‘you belong among the wildflowers’ on the back. We danced all night to the band Riverside Lights. “Something old: My mom’s wedding shoes. Something borrowed: Earrings from my friend, Jane, who runs her own antique jewelry business called Prather Beeland, Inc.
Something blue: Sapphire engagement ring from my groom.